We are heartened the National Academy of Sciences (NAS) is assessing how to improve accessibility and quality of medical services for people exposed to nuclear testing fallout and whether to expand eligibility under the Radiation Exposure Compensation Act program. We understand that you are advising the U.S. Health Resources and Services Administration (HRSA) on these questions. Your work has been long and desperately needed. We, like many, see it as part of the U.S. government’s effort to begin to face the health and environmental legacy of the Cold War after a long and damaging period of denial. The United States has been a leader among nuclear weapon states in regard to compensating the people affected by nuclear weapons production and testing. We hope that your work will result in policies that will continue and extend that leadership. We are writing to you in that spirit. The subject of estimating doses from iodine-131 fallout from U.S. nuclear testing is, as you must be aware, very complex. However, some things are clear. We are in broad agreement with the 1997 National Cancer Institute (NCI) report that dealt with iodine-131, despite the study’s numerous and admitted uncertainties. Doses to the thyroid alone showed extensive exposures across the United States. 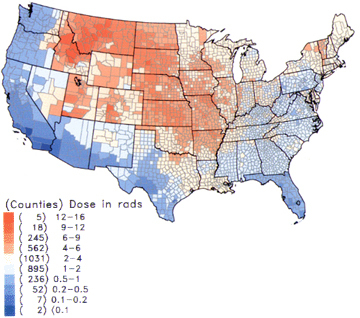 As shown in the map below (which represents county-level per capita average thyroid doses from Nevada Test Site tests only), hot spots were scattered across the continent. The most affected counties were as far away as Idaho, Montana and the Dakotas. People who lived in the “red” and “pink” counties in the map may have received, depending on their age and milk intake, high I-131 doses. The data indicates that some farm children, those who drank goat’s milk in the 1950s in high fallout areas, were as severely exposed as the worst exposed children after the 1986 Chernobyl nuclear power plant accident. Such exposure creates a high probability of a variety of illnesses, yet the government has not effectively informed people in these affected areas. People who, during the 1950s and early 1960s, lived in the red and pink counties – and, considering the report’s uncertainties, people in and the counties that surround them – should be informed about their potential exposures. This group should include people who may no longer live there. Farm children who drank goat’s milk in these areas may have had doses of ~100 rad. While there will always remain questions and issues about definition of the affected population, we believe that this would be a good minimal starting point for defining the areas highly affected by fallout.We request that your committee go to towns like Challis, Idaho, and places in the intermountain West and Plains states, and hold meetings in order to hear from people about their experiences and inform them about your study. We call your attention to a recent Idaho newspaper article, attached, that recounts some individual stories, including those of people who drank goat’s milk. Inform people in high-fallout counties about the facts, their possible risks, and what they should be doing (how to identify symptoms, what to ask their health care provider, how to use the online dose calculator, where to go for more information, etc.). This would involve broad public education efforts, such as holding meetings, publishing ads in newspapers and running TV and radio announcements, so that people can be alert to the symptoms and seek early diagnosis and treatment of a disease. Train medical professionals so they know the facts and the risks themselves, and can identify and treat exposure-related illnesses and disease in their patients. This can and will save lives. When one of us (Arjun Makhijani) went to Challis several years ago [on a trip organized by the Snake River Alliance], his talk inspired the brother of one the attendees to ask his doctor about thyroid cancer, leading to early detection and life-saving surgery. He had had strange symptoms that his doctor had not traced to fallout before that time. RECA, the Radiation Exposure Compensation Act, is a compensation program for some Nevada Test Site downwinders in some counties in Nevada, Arizona and Utah. This is clearly not sufficient. There are hot spots thousands of miles from tests sites. We ask that the committee be a leader in calling for a new official definition of ‘downwinder’ that would include people who, during the 1950s and early 1960s, lived in the high-fallout (red and pink) counties and surrounding counties. The new definition of downwinder also should include people who once lived in these counties but may no longer. We recognize the utility of dose reconstructions, but the burden proof must not be on exposed individuals to assess what happened to them. Due to the NCI report’s uncertainties, the committee should remain tentative about those groups of individuals it may recommend or imply notbe covered under RECA. The committee should give the benefit of doubt to the victim, not the US government/nuclear weapons establishment which deceitfully caused the harm in the first place.This is all the more essential in the case of milk contamination from fallout. During the 1950s, the U.S. Atomic Energy Commission (AEC) provided advance data about expected fallout patterns to the photographic film industry because Kodak threatened it with a lawsuit after the very first test. But the AEC took no action to protect the U.S. milk supply. In 1962 the Federal Radiation Council even sought to prevent states that wanted to take action from doing so. Please refer to Pat Ortmeyer and Arjun Makhijani, “Worse Than We Knew,” Bulletin of the Atomic Scientists, Vol. 53, No. 7, Nov./Dec. 1997. We will be happy to provide you with detailed documentation if you like. There are a large number of people without access to health care. Those without health care coverage in the pink and red counties and the counties that surround them should be given free medical care by the government. This health care should also be offered to people who were children in these counties during the 1950s and early 1960s. The government should also widely publicize the map of highly affected areas so that people who were children then in those areas can benefit from the offer of health care as well. Women who were children in the 1950s and early 1960s or who were of child-bearing age then should be a special focus of this program due to the disproportionate risks faced by female children and by developing fetuses. The cost of fallout-related illness is something that should be a governmental responsibility whether covered by private insurance or not. Thyroid cancer incidence is among the fastest growing of all cancers in the United States, especially among women. Synthroid, a prescription drug used to control thyroid disease, is the third most widely prescribed drug in the country. While certainly not all people with thyroid cancer or on Synthroid were affected as such by radioactive fallout, nuclear testing likely contributed a portion of this health problem. The committee should make a recommendation about how the government should deal with this cost. We request that you recommend that the U.S. Centers for Disease Control and Prevention (CDC) take up the issue of the health consequences of fallout from the July 16, 1945 Trinity test. This is a long-neglected subject even though clear evidence of high fallout was established by Col. Stafford L. Warren as early as July 21, 1945. You can link to his memorandum to Gen. Groves from the IEER web site at http://ieer.org/resource/commentary/anniversary-nuclear-test-fallout/. Thank you for considering these comments. The Institute for Energy and Environmental Research has studied and been concerned about the health and environmental effects of nuclear weapons production and testing since 1987. IEER has published a number of books, reports and articles on the subject, including Nuclear Wastelands: A Global Guide to Nuclear Weapons Production and Its Health and Environmental Effects and Radioactive Heaven and Earth: The health and environmental effects of nuclear weapons testing in, on, and above the earth. We have provided comments on a number of National Academy and official radiation-related studies, including the committee on the Biological Effects of Ionizing Radiation (BEIR VII) and the committee that reviewed the CDC-NIH Feasibility Study of the Health Consequences to the American Population from Nuclear Weapons Tests.We look forward to the committee’s response to our comments. We would be happy to meet with you and/or with Dr. Al-Nabulsi to discuss these issues further and would like to request such a meeting. Attached: “ Idahoans downwind from nuclear fallout talk about living with cancer,” article and photos published Aug 29, 2004 in The Idaho Statesman.